Stir those 4 ingredients together and pour into a pan that has a lip/edge, so that when you stir the granola, it doesn’t slide off into your oven. Now, you can stove top roast this concoction in a cast iron skillet, if you like. Or heat your oven to 350 or so, and stir and bake the oat mixture for 10-15 minutes until you like the dryness of the flakes. If you are a multi-tasker (or you can do this before you begin w/the oats), into a large bowl pour in some coconut sugar, spices (like cinnamon, allspice, coriander, cardamom, nutmeg, etc), sesame seeds, and coarsely chopped hazelnuts. 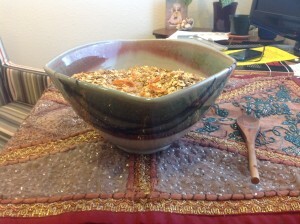 When the oats are finished baking/roasting, pour them into this large bowl mixture of spices, etc. Stir it all up. Yum. Done. You could also add my new secret ingredient, which is homemade candied citrus peel. It’s good for you, and adds a nice zingy bright AWEsomeness to the mix. If you can afford to top your individual serving with hemp seeds, that’s good, too.